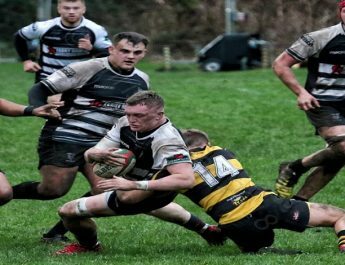 Cross Keys were knocked out of this season’s WRU National Cup, as championship champions elect Pontypool secured a victory that takes them through to the quarter final stages and allowS Keys to concentrate on the far more important task of Principality Premiership survival. 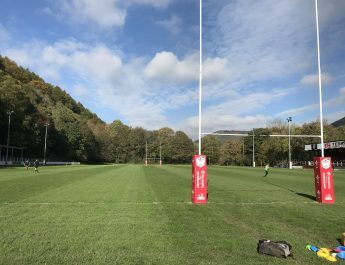 The Keys started well and went ahead with around 5 minutes played when Jacob Botica slotted over a well taken penalty after Pooler were penalised for a high tackle on the 22 metre line. Keys remained in control following the restart but when looking to launch another attack Keys spilled the ball around the visitor’s 22 and Pooler reacted quickly to pick up the loose ball before hacking on down field as they broke down field and entered the Keys’ half. Pooler scrum half Martin Luckwell won the foot race to pounce on the ball and cross for the game’s first try in front of the youth club, arguably against the run of play, with just under 10 minutes played. Centre Kieran Meek added the conversion from out wide. 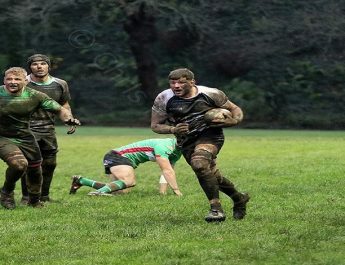 The Keys didn’t let their heads drop and went back on the attack as they patiently built good field position in the increasingly difficult conditions. This build up play led to Keys kicking to the corner from a penalty and after Pooler illegally halted Keys driving lineout attempt, Keys again opted for a kick to the corner. 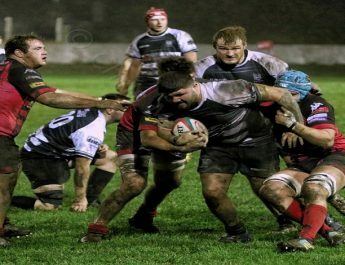 Pooler again were guilty of stopping the driving lineout illegally and after a warning was issued first time around, the referee had little choice but to send Pooler prop Aaron Coundley to the sin bin as he was adjudged as the guilty party with around 16 minutes on the clock. The Keys tried again with the driving lineout but Pooler’s defence was well organised and they eventually cleared the danger as Keys couldn’t make their one man advantage tell despite their efforts. The score remained at 7 points to 3 in Pooler’s favour right up until the last play of the first half when Jacob Botica slotted over a second penalty for Keys to close the gap to a single point. After a solid start to the second half, the visitor’s had a chance to extend their narrow lead just 3 minutes in to the second half with a penalty but Kieran Meek’s attempt from around 35 metres was wide. With just over 50 minutes on the clock Keys, now attacking the clubhouse end reclaimed the lead as Jacob Botica was again on target with his 3rd penalty of the afternoon after Pooler went off side at the tackle area. Pooler had a chance to retake the lead just 5 minutes after this but Meek struck the post with a relatively straight forward penalty attempt from around 25 metres out. With conditions becoming increasingly difficult entering the closing quarter it was going to be a nervy 20 minutes for both sides and the feeling in general was that it would either take a moment of brilliance or a mistake to take the spoils such was the intensity of the game. The crucial moment came around 12 minutes from time when Pooler benefited from some poor one on one defending and former Keys winger Lloyd Lewis seemingly created something from nothing as he slipped through a number of tackle attempts and squeezed his way through to cross for his side’s second try of the game with Keys left chasing shadows as Lewis bought a rare moment of quality to the tie to win it for his side. In all fairness Keys didn’t really create anything in the closing stages as Pooler stayed in control and managed the game and conditions better to secure the victory and take their place in the last 8. 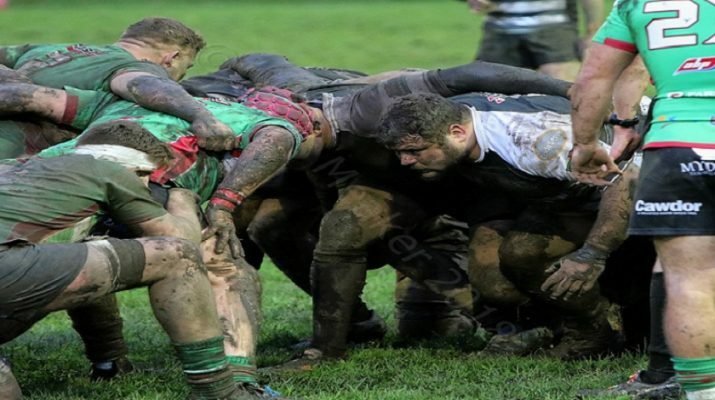 Overall not a good day at the office for Keys as Pontypool deservedly claimed the victory after a tough encounter where, perhaps Pooler’s experience shone through. The likes of Danny Hodge, Rob Nash and Geraint Walsh have all won the cup in recent times, the former pair with Keys back in 2012 of course and their individual experience and big game attitude will no doubt mean that the Championship side are well placed for another shot at Premiership opposition in the next round, whilst Keys will focus on their primary aim of survival in the Principality Premiership.